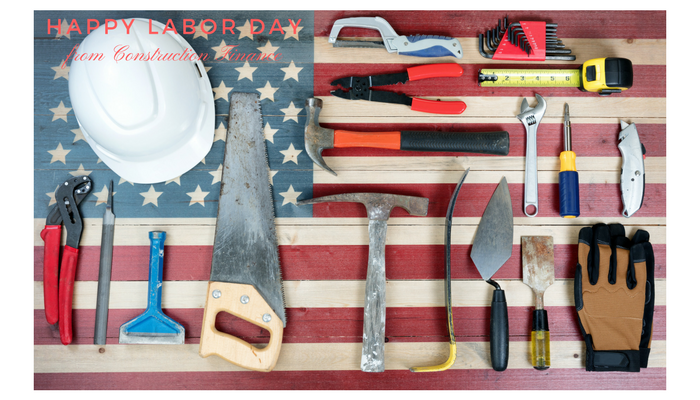 Here are a few facts about Labor Day that you may not know. Why do we celebrate Labor Day? Where did Labor Day come from? When was the first Labor Day? 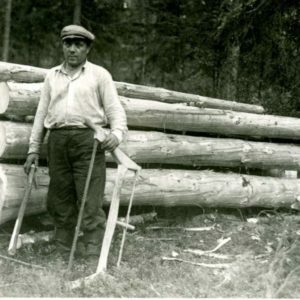 The History Channel website has tons of information regarding the origin of Labor Day. Here are a few facts to get you started. Labor Day, an annual celebration of workers and their achievements, originated during one of American labor history’s most dismal chapters. In the late 1800s, at the height of the Industrial Revolution in the United States, the average American worked 12-hour days and seven-day weeks in order to eke out a basic living. Despite restrictions in some states, children as young as 5 or 6 toiled in mills, factories and mines across the country, earning a fraction of their adult counterparts’ wages. People of all ages, particularly the very poor and recent immigrants, often faced extremely unsafe working conditions, with insufficient access to fresh air, sanitary facilities and breaks.As manufacturing increasingly supplanted agriculture as the wellspring of American employment, labor unions, which had first appeared in the late 18th century, grew more prominent and vocal. They began organizing strikes and rallies to protest poor conditions and compel employers to renegotiate hours and pay. Many of these events turned violent during this period, including the infamous Haymarket Riot of 1886, in which several Chicago policemen and workers were killed. Others gave rise to longstanding traditions: On September 5, 1882, 10,000 workers took unpaid time off to march from City Hall to Union Square in New York City, holding the first Labor Day parade in U.S. history.The idea of a “workingmen’s holiday,” celebrated on the first Monday in September, caught on in other industrial centers across the country, and many states passed legislation recognizing it.Congress would not legalize the holiday until 12 years later, when a watershed moment in American labor history brought workers’ rights squarely into the public’s view. On May 11, 1894, employees of the Pullman Palace Car Company in Chicago went on strike to protest wage cuts and the firing of union representatives. Commercial contracts up for bid are plentiful after you have waded through mounds of red tape. Bidding on contracts is exciting to say the least and only topped by the heart racing experience of being awarded a contract. The hard part is figuring out how in the world you are going to have enough capital to buy materials and pay subcontractors. And all before ever getting paid for the first invoice you submit. That’s where Construction Finance can help. We buy (or factor) the invoices you submit to the general contractor. We pay YOU for that invoice IMMEDIATELY and we wait to be paid by the general contractor. Thus giving you the cash you need to pay for materials and pay subcontractors. This not only keeps your supplier happy but keeps your subcontractors on the job! Take a look at or print our APPLICATION here. 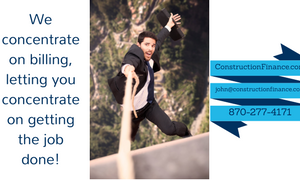 Call Construction Finance today to find out if accounts receivable factoring is right for your construction company! Watch a quick VIDEO explanation of how construction factoring works here. Construction Finances funds Time and Materials Electrical Contractor up to 100k monthly to perform work on large Power Plant Projects. With much needed cash flow, the contractor has migrated from billing 20k monthly to over 100k monthly. So many growing subcontractors share with us that they need someone in the office to help with the stacks paperwork that accompany commercial contracts. 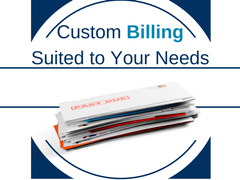 In order to serve our clients and accomplish our mission, “To Help our Customers Grow” we saw a great need for billing support and answered the call. -My wife is doing all of our billing and payroll. She has a day job, but tries to fit me in. I need to hire another person. -I am going to hire a real CPA to “Take over the books”, but, its gonna be expensive. -This pay app is going to pay late because it was billed late. -We have plenty of work; we are swamped; we just don’t have time to slow down and bill for all this work. I recently visited with an overworked electrical contracting crew that was behind on his pay apps. I stated, “you bill over $50.00 per hour, per man on the job. Why would you pull off the job yourself to go do your quickbooks? Do you get paid this much to do billing? Has anyone ever offered you $50 per hour to be an accountant? I advised him to stay on the job sites for billable hours, and use sharper, more affordable experts to do his paperwork. At Construction Finance, we have shared with our clients that they have 2 choices. They can hire new employees to streamline their paperwork and billing. Typically, the applicant for this position needs to have accounting experience as well as be well versed in the commercial construction industry. Needless to say, this is a difficult skill set to be filled by one person. Ultimately, this adds to overhead. The indirect costs to bid the next project just increased. Don’t have time to “Sharpen your Saw”? Construction Finance offers “Back Office Support”. Our in house accounting staff is very well versed in all aspects of your industry. We keep our ‘Saw Sharp’. Our accounting staff has experience invoicing MILLIONS PER MONTH. Construction Finance offers Subcontractor Back Office Services. Call Today to see of our Back Office Services could benefit your company. Customer/GC: Will I have to change my contract/subcontract? Subcontractor: No, your contract still has the same legal rights with the subcontractor. Customer/GC: Is my subcontractor “Selling his Contract” before the work is done? Subcontractor: No, we only purchase invoice amounts for work already completed. Customer/GC: Will the invoices arrive come from a different person now? Subcontractor: No, your Subcontractor continues to invoice you. Only the remit to address changes. Customer/GC: Will setoffs or deficiencies be treated differently? Subcontractor: No, it is still the subcontractors duty to complete all requirements of the contract. 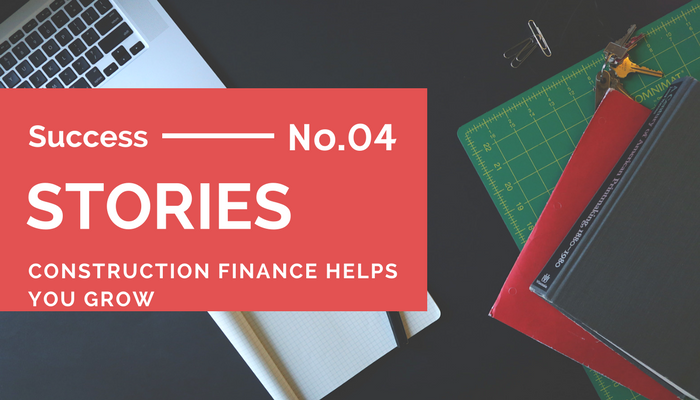 Customer/GC: Is Construction Finance a collection agency? Subcontractor: No, we purchase invoices as a Factor for a small discount. Customer/GC: Do I loose any rights with my current lien waiver process? Subcontractor: No, Construction Finance will not purchase invoices that could potentially involve unpaid suppliers. 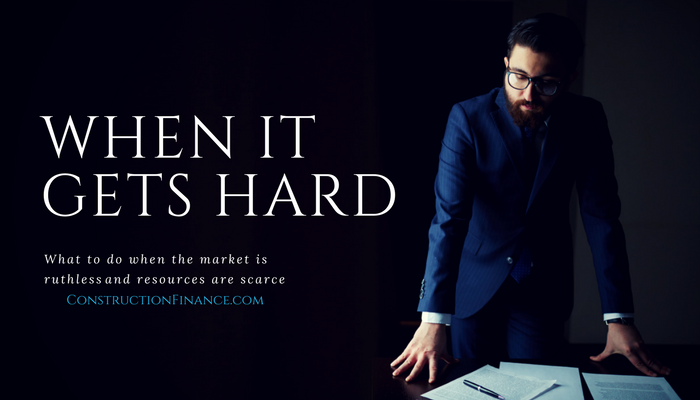 On the contrary, Construction Finance helps ensure our clients keep all underlying suppliers paid to prevent unwanted liens or bond claims. Customer/GC: So what really changes? Subcontractor: The Remit to address for your payments to your Subcontractor. Are You Trying to ‘Brand’ Your Business? If you are getting your new business off the ground or simply trying to relaunch an established company, branding may be exactly where you need to focus your efforts. Branding is simplifying all the various aspects of your business. Put simply, what ‘need’ does your business fulfill? Who’s ‘need’ does your business cater? Create a quick 30 second ‘elevator speech’ that explains precisely what your business does. Create an appealing yet simple logo. Research what social media platforms your prospective clients are actively present. 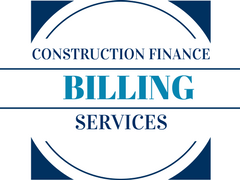 Construction Finance buys commercial construction invoices from contractors and subcontractors. We pay you for the invoice and wait to be paid by the account debtor. That is our ‘elevator speech’. We are active across many social media platforms. Our ideal clients are contractors and subcontractors of all trades. Some work for the government, some work for large general contractors and some do a little of all. We also accept client referrals from factor brokers. We often receive calls from freight factors when they are contacted about factoring a construction invoice. Construction factoring is a little more tedious and involved than other types of factoring and we are honored to go the extra mile for your client referrals. Construction Finance is mindful today of all those who fought for America’s freedom and paid the ultimate price. Thank you. 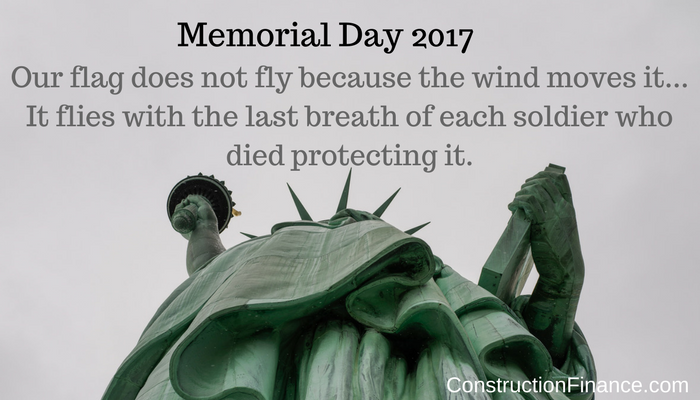 Construction Finance is mindful today of all those who fought for America’s freedom and paid the ultimate price. For more information on how factoring works or if it’s a good fit for your company, contact John Sawyer today. Construction Factoring is BOOMING! We have new stories to add to our list of successes each day! Thank you to all our clients!! Construction Finance approves LA Concrete Contractor for 150k. The contractor had steered clear of larger municipal projects in the New Orleans area. With Construction Finance, he is now bidding and being awarded more local and state projects. So you have an idea for a business that you just know will be a booming enterprise right from the start? Don’t just day dream about it, go out and do it! The U.S Small Business Administration (SBA) has published the below 10 steps to starting your own business.